XTERRA FS400 Elliptical Trainer is designed to help you achieve your fitness goals faster with its 18-inch stride in a comfy elliptical movement, and without causing much impact on your joints unlike treadmills or standard bikes. It will help you work on your upper and lower body in a synchronized and optimal range of motion. It has a big 5.5-inch size bright blue LCD-backlit display panel that shows the usual indicators of speed, distance, calories, time as well as the program profile, watts, level of resistance and pulse rate connected to the sensors on the stationary handlebars. You’ll find eight integrated preset workout programs. And there are the easy access buttons for Quick Start, Manual, Climbing, Interval, Test, Watts, User, HR, Recovery, and Body Fat. You will also find the Start/Stop, Mode, Down and Up options. With the 14.5 lb. flywheel, belt drive system and magnetic resistance that is free of frictions you can enjoy smoother and quieter workout. And the unit will not need much maintenance. You have a total of 20 resistance levels to choose from, which you can vary during your workout depending on what you wish or can handle on the day. It has an ergonomic design and with a distance of 2 inches between your left and right feet, you have the optimal stride biomechanically. You can exercise in both forward and reverse directions to target different muscle groups and do one of the preset programs or your own workout at your own pace. The textured anti-slip foot pedals are very large and comfortable with the inward tilting of 2 degrees for a lengthy workout. 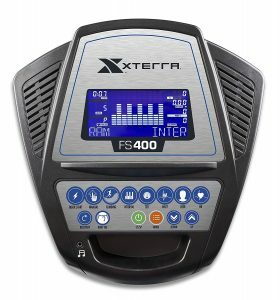 The XTERRA FS400 looks sleek and modern, is a rather heavy product that weighs 145.5 pounds and measurements of 21.3 x 61.2 x 145.5 inches and includes wheels at the front so you can move it easily. The steel frame is resistant to corrosion and makes it solid, robust and durable, so it should last a very long time. You also have the high-end bushings, sealed bearings that are commercial grade, and concave durable wheels on the aluminum tracks. So you can feel safe and stable on it and enjoy the smooth and quiet operation throughout your workout. You can listen to music while you’re exercising, through the integrated audio jack and the MP3-compatible speakers which deliver acceptable sound performance. The magnetic resistance brake is computer controlled and the 100 Volts plug-in adapter powers it and any electronics available on the elliptical trainer. There is a bottle holder in the middle, an accessory tray for your MP3 player, smart phone or other small items and a reading rack just underneath the LCD display, which will come in handy but will cover the screen. As a solid and durable product, the maximum it can carry is specified as 325 pounds, which means the majority of the population can use it comfortably and on a daily basis. In the package, you will find the Elliptical Trainer, power adapter and the user manual with the assembly and operation instructions. It requires some simple assembly but should not take more than half an hour as it is all pretty straightforward. Please note that the resistance will take a couple of seconds to adjust each time you move it up or down. This is a high-end very good quality product with a year of warranty on the labor and parts and the impressive lifetime warranty on the brake and frame.